In the Spacetrace Card-Game two neighboring planets are fighting against each other with their fleets. Each player tries to destroy the base of the opponent with an attacking space fleet or other tactics. If you play Spacetrace for the first time, you should play a simplified version for a start, You don't have to read the text marked with grey background color. Take some time and read this manual, especially read thoroughly the whole section about battle. Sort out the cards named "Base" (it's a class IV ship with 1000 life points - LP). Each one of you puts one "Base" card face up in front of you on the table. This is the first card of your first fleet (a second extra fleet can be started later in the game). In battle the "Base" counts as a class IV ship card. It represents the HQ of all your fleets. Get pen and paper to write down the damage done to your base. Sort out all tactic cards (blue), Commander cards (brown), class II ships (grey and with class II Symbol) and also the class III Apollo Ship Card and the Motherships. Both players get minimum 40 cards that should contain about 15 reinforcement cards, at least one commander card and at least one Mothership. Both players shuffle their library. Both players draw 4 cards, do not reveal them. The player that has his/her turn is called the active player. Most cards need manpower = MP to be played. you get MP by playing reinforcement cards. You only get the MP for one time, the played reinforcement cards are discarded. To bring a ship card into play, you need enough MP. So you need to play one or more reinforcement cards with the ship card, that have a total MP that is enough to play the ship card. Some ship cards require an extra activation condition (for example sacrifice another card). if this condition cannot be fulfilled, the card cannot be played. The played ship cards are placed on the table in front of you next to your base, ordered by ship class. Ship cards can contain more than one ship. For example the "Fighter" card contains 100 Fighters, the "Destroyer" card 10 Destroyers etc. If it has more than one ship, the number of ships is printed on the cards upper left. Special battle effects and activation conditions are printed below the picture on the card. Tactic cards can be played any time in the game. Some tactic cards need MP in the same way like the ship cards. If a player plays a tactic card the opponent may answer with another tactic card. The effects are resolved last in, first out. That means that the last played effect is resolved first. This way it can happen that a tactic card targets nothing. If this happens, that card will have no effect at all, it fizzles, and is discarded. Tactic cards can be countered (for example with the card "Counter Strike"). The target card and the counter tactic card will both be discarded. After the effects of all tactic cards are resolved those cards are discarded. 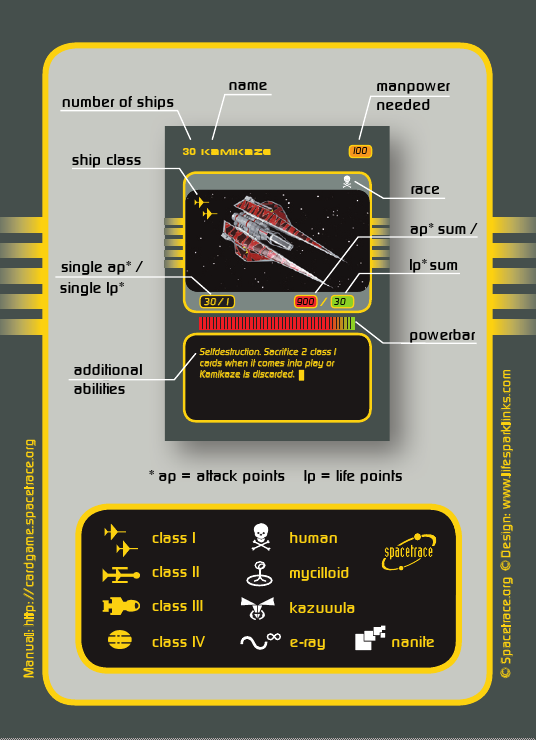 Commanders can only be placed on ship cards with the class indicated on the commander cards and stay on those ships. They will improve your tactical skills. The effect of the card will be active as long as the commander is in play, even if the ship of the commander doesn't take part in the battle. You can only have one commander card on your side in game at the same time. If a ship with a commander on it gets destroyed, both cards get destroyed. At the beginning of each turn the active player draws 2 cards. if there are no cards left, no card is drawn (the discarded cards cannot be drawn again). discard 3 cards from you hand to get 100 MP or to draw a new card. Discarded ships are removed from the game. The active player can play as many tactic, ship and reinforcement cards as he/she wishes and maximum one commander card. the other player can only play tactic cards (and eventually the needed reinforcements). Tactic- and reinforcement cards can be played any time, commander and ship cards are only played by the active player. Only if the active player decides to start an attack a battle happens. Every player can choose the order of ships in each class stack (ship cards of each class) in his fleet(s). The active player (attacker) has to choose order first. At least the base fleet of the attacker must attack. If the attacker has an extra fleet, the attacker decides if this fleet attacks also. The base fleet of the defender must defend, the other fleet may defend. Then each single ship on each card fires exactly one shot with its single AP at exactly one target ship. The AP will cause damage on the target ship that will be subtracted from its LP. if a ships LP is zero (or below zero), it is destroyed. if a ship is not destroyed, the next ships will continue to fire at this ship. Both cards are destroyed because they both cause 1 damage on 100 targets each. The battle is split into class-battles (similar to the online-game): first class-I against class-I, then class-II against class-II etc. If some classes are missing the class-battle then happens between the class and the next higher class of the player that has the missing class. I vs. I; II vs. III; III vs. IV; IV vs. IV. In one class-battle all ships on all cards fire in the chosen order. All ships shoot on the actual first ship on the first ship card of the opponent with at least 1 MP left as long as not all ships on that card are destroyed completely. if all ships in the class of your opponent are destroyed, your remaining ships in that class do not continue fighting. Your next class will start fighting. Example: player 1 has 4 Cruisers, player 2 has only 1 Cruiser. Both players have an existing class III so all ships on both sides will target class III. Each player will loose one Cruiser. The remaining 3 Cruisers of player 1 will not fight because their target was already set on class III. Some ships have special abilities printed on the card. They always depend on the battle order of each players cards. An effect that targets some ships always target the next ship in battle on your or the opponents side. On your side it always targets your next ships (on the same ship card or the next ones in battle), that haven't already shot. If the effect targets your enemy ships, it will begin with the actual target, that your last ship shot at (the first opponent ship if this is your first ship). Sacrifice: a sacrificed card is discarded and cannot be repaired nor reconstructed. Some cards or effects require sacrificing of another card to be played, that means that you cannot play the card if you cannot sacrifice the required card/ship. Selfdestruction: a ship card with selfdestruction will be killed after it was involved in a class-battle. Jam: a jammed ship cannot shoot nor use special abilities. Jamming always happens as preemptive strike. The Base cannot be sacrificed nor removed from the game. It is also immune against the destroy, kill and repair effect but not against damage done by ships or tactic cards. A Battle ends if all ships shot or lost their targets (in case a class was destroyed completely during a class-battle). In case a player has more fleets, the next battle between the next fleet will start now. Unlike the online game, damaged ships will keep their damage until end of turn, so a ship can be destroyed with ships from different fleets. In our basic card-set there is one "Mothership" available for each player. With a "Mothership" you can open an extra fleet. Then you can move your ship cards from your base fleet into your extra fleet and back. Only the active player can move ships between fleets. It is a very useful option for combined attacks. In a battle you can choose for your extra fleet to fight or not to fight, and if, if before or after your base fleet. then a second battle will happen with your base fleet against the rest of the enemy base fleet. Both players decide, their extra fleets fight first. Remember: your base fleet must fight if a battle happens. If a "Mothership" gets destroyed all other ships in that extra fleet get destroyed too. The active player decides that he has nothing more to do and says: "ready". Then the other player takes his/her turn. All ship cards that are not destroyed totally in one turn, will stay. All ships on those cards are restored now! (except the "Base") for example a "100 Fighters" card that lost 50 Fighters will have all its 100 Fighters back now. if no player can draw any more cards and can't or doesn't want to play any more cards and the next battles wouldn't destroy any more ships. You win if your opponents "Base" card gets 1000 or more damage points (the damage done to the "Base" is cumulated over all battles). if the game ends without a base getting destroyed, that player with the most damage on the base looses the game. Wrecked ships are all ships, that were discarded. Ship cards that are removed from the game don't count to the wrecked ships. Winner is the player with the highest score. The game ends if one "Base" is destroyed. Both players count their wrecked ships total MP. A destroyed "Base" counts 500 MP. Each player gets the amount of wrecked ships of the opponent as score. Commando Fighter: "Your next ship..."
Reinforcement 2: "Deals 40 damage to any target. Errata "Deserter": it is also possible to exchange a Mothership. But not the base. text: "exchange the ship cards with the highest MP... If one ship is already damaged, it stays damaged until end of turn"
Bounty Hunter: "The Bounty Hunter destroys the next opponent class I, II or III ship in the class-battle, but only if that card contains already damaged ships." each Player must destroy the base of the player on his left side. If a player succeeds to destroy the left base, then both other players loose simultaneously and equally. all texts on cards, that refer to "both players" now refer to "all players"
your cards are sorted into two piles, one wit reinforcements and one with all other cards. This page was last modified on 3 August 2011, at 01:04.